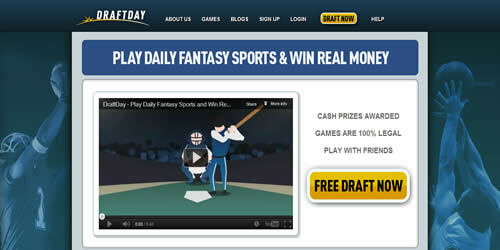 The daily fantasy sports landscape continues to grow with the introduction of DraftDay.com. The creators of DraftDay are no strangers to creating popular gaming sites - having been creators in Cardrunners, a popular online poker site. Given the success of their original endeavor, it’s safe to bet that DraftDay will be a major player in the daily fantasy sports landscape for years to come. To begin our DraftDay review, we look at the website itself. The look of DraftDay at first glance is appealing to the eye. It’s very simple and easy to navigate. The site doesn’t bombard you with a lot of advertising and pop-ups and simply focuses on the games available. Using an older computer when checking out sites allows to see how the website reacts to slower processors to load pages and access games. It was a pleasant experience to visit DraftDay and have no delay at all while the list of games loaded on the page. Most sites have a short delay when switching between sports or fees for games. For those daily fantasy players that don’t have a state of the art computer, this is a welcome feature. The layout is simple allowing you to click the sports you are interested in and then arrange the available fantasy games in order of fee, number of players and type of game (salary or private). DraftDay also includes a simple tutorial so that newcomers can become comfortable with the site - a nice touch. DraftDay has begun their foray into daily fantasy sports games with the top 4 fantasy sports: fantasy NFL football, fantasy NHL hockey, fantasy NBA basketball and fantasy MLB baseball. It remains to be seen if DraftDay opens up other popular sports such as daily fantasy golf or daily fantasy NASCAR like some of their competition. If they do add any sports, we would immediately post about it to our Facebook and Twitter pages. Games against 2, 3, 5, 10 or 100+ players with entry fees of free, $1, $5, $10, $25, $50, $100+ are offered for salary cap games or private leagues. There is even a guaranteed prize pool in which even if you finish dead last in points you will get some money back. On a $100 game, the last place finisher receives $2.01 back so it’s not a huge factor in choosing games, but obviously getting something back doesn’t hurt - especially in the long run. The salary cap games set a cap of $100,000 for 9 positions. For NFL football fantasy games, players range from the low $20,000’s to a low of $5,000. For NHL fantasy hockey games the same salary cap applies, but the prices range from about $15,000 for the top players that night to a low of $1,000 per player. There is an ongoing Average Salary Remaining Per Player counter which tallies what the average would be left if you pick a higher or lower priced player. For some fantasy players this will be insignificant, but for someone who uses an average to help create a salary cap team, this is a welcome feature to have. 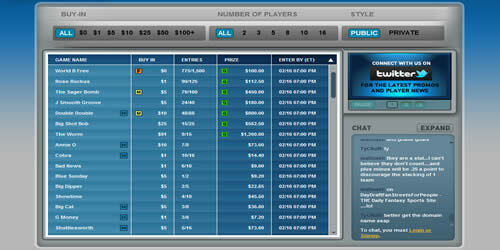 The team at DraftDay looks like they are poised to make a run at the top daily fantasy sports mountain. Backed by previous experience, their goals are highly achievable. We hope that new sports such as fantasy golf and fantasy NASCAR are introduced as well as college football fantasy and college basketball fantasy. As well, different game formats such as sit down drafts would be welcome to counter the simple salary cap game format. 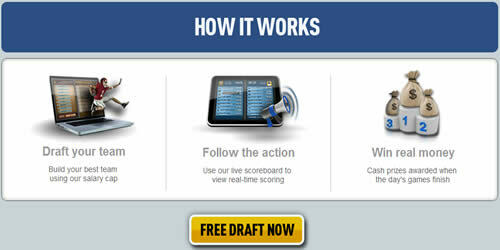 The look and interface of the site make playing fantasy games at DraftDay a pleasant experience and the simplicity of the site is a welcome change from the ad-filled pages seen on other daily fantasy sites. If you are looking to check out a new daily fantasy sports site, DraftDay is one you must check out!